It was King Henry VII, father of King Henry VIII, who brought the name Richmond to London. Inheritor of the title of the Earl of Richmond (the title relates to lands in Yorkshire and centres on the castle of Richmond), on being crowned king, Henry VII gained the use of Sheen (or Shene) Palace located on the banks of the Thames, about seven miles south west of Westminster (the history of which we’ll look at in greater detail in an upcoming post). 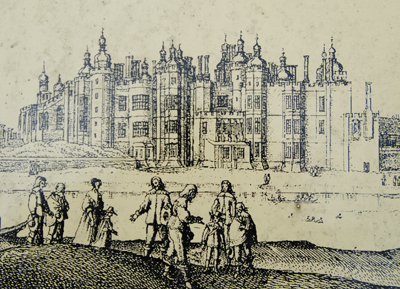 Sheen Palace was largely destroyed in a fire in 1497 and the king gave orders for it to be rebuilt (Richmond Palace is pictured here – found on a sign at Richmond). It was on its completion in around 1502 that Henry decided to rename the palace after his former earldom – Richmond. The name Richmond, by the way, comes from a French word for ‘old hill’. The once separated town of Richmond is now at the centre of the London Borough of Richmond upon Thames (it became a municipal borough in 1890) and a popular residential suburb for London’s wealthy (among those who have lived there are Mick Jagger and Jerry Hall) – sought after for its riverside amenity, quaint village green, and panoramic views from Richmond Hill as well as its fine shopping and dining. Richmond’s other great drawcard is Richmond Park, one of the city’s eight Royal Parks, and home to more than 600 deer (see our earlier entry on it here).